Economic inequality inspired Occupy Wall Street, a movement that in a few short months transformed our political discourse with the concept of the “1 percent” and the “99 percent.” Today the presidential candidacy of Bernie Sanders is altering the political landscape with a call to reduce inequality. Why does this theme resonate with so many voters? How does it intersect with other issues like social justice, national security and the environment? Is inequality irreversible? We are living through the greatest “wealth grab” in history. But inequality is not produced by immutable forces. It’s the result of a legislative agenda promoted by the rich and executed by their political allies. The struggle to change this agenda and end inequality is inseparable from the other critical struggles of our time. What follows are 10 facts about the 1 percent – but they’re not just statistics. They’re a paint-by-numbers picture of an economy, and a democracy, in urgent need of change. 1. Not so long ago, growth and prosperity were more widely shared in this country. There was a time in living memory when the growth in American productivity was shared much more broadly than it is today. This led to the growth of a middle class whose members could meet their own needs, afford some luxuries, and raise and educate their children – often on a single working person’s income. While many people, especially people of color, were shamefully excluded from this prosperity, the postwar American experience shows us that it is possible to promote broadly shared economic growth. If the national minimum wage had kept pace with productivity, says Schmitt, it would have been $22 per hour by 2013. 3. Most of the nation’s income gains are now going to the top. And most of the gains since the 2008 economic crisis have gone to the wealthiest among us. Meanwhile, in what is sometimes called “the middle-class squeeze,” the middle-class cost of living has risen significantly. 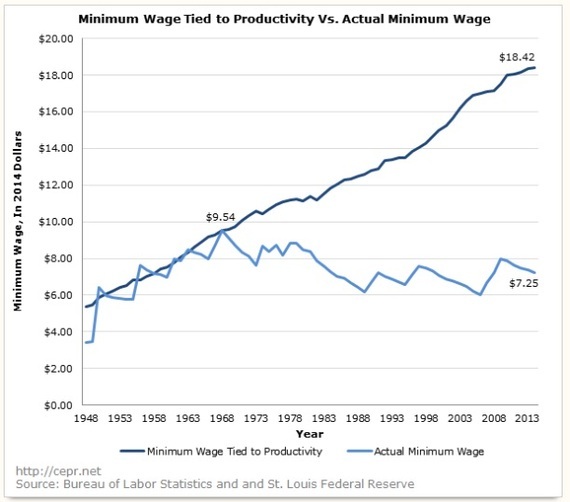 Even after wages are adjusted for inflation, middle-class income has failed keep up with increases in such costs as child care, higher education, health services, retirement, and housing – expenses that disproportionately affect middle-class households. 4. 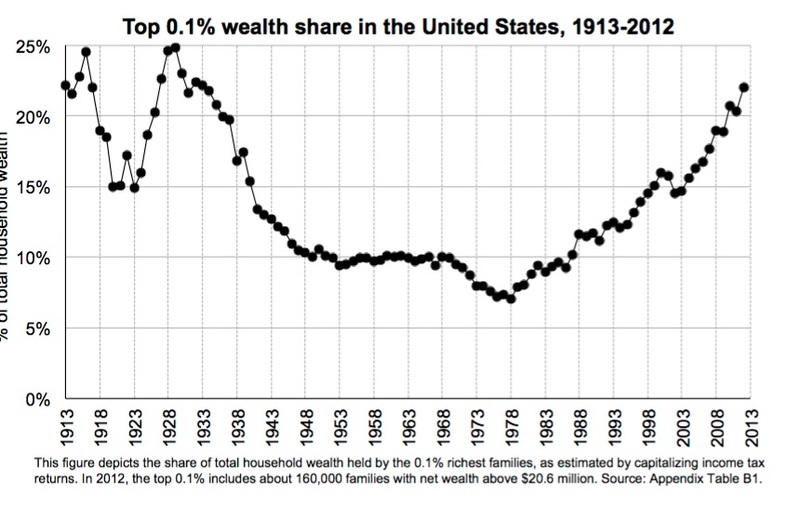 Wealth inequality has returned to levels not seen since the Roaring ’20s. 5. The 0.01 percent – a tiny group of people – controls a vast amount of wealth. As a result of this surge, 16,000 Americans hold as much wealth as 80 percent of the nation’s population – some 256,000,000 people – and as much as 75 percent of the entire world’s population. The combined wealth of these 16,000 people is more than $9 trillion. A few billionaires are even wealthier. In the United States, 536 people had a shared net worth of $2.6 trillion at the end of 2015. These days even the top 0.01 percent isn’t immune from inequality. 7. CEOs are taking up a bigger piece of the pie, and workers are getting less. Fortune 500 CEOs earned about 42 times as much on average as the typical worker in 1980. Today they earn 373 times as much. In fact, seven of this country’s 30 largest corporations paid their CEOs more than they paid in taxes. 8. The average American household is falling behind on wages. The median household income in the United States fell by more than 7 percent between 1999 and 2014. It’s now slightly over $53,000. 9. The average American owns less wealth than people in many other developed countries. The median wealth of an American adult is roughly $34,316. 10. More than one child in five lives in poverty. The U.S. poverty rate for children is over 20 percent, higher than that of all other major developed countries. The only other nations in the OECD with similarly high rates are Chile, Israel, Mexico, Spain, and Turkey. By contrast, child poverty is less than 9 percent in the Nordic countries and Austria, and is less than 10 percent in the United Kingdom. Even those rates, which are less than half the American rates, should be considered unacceptable. Overall, more than 48 million Americans live in poverty. According to experts like Nobel Prize-winning economist Joseph Stiglitz, the expansion of the financial sector has contributed significantly to the current crisis. So has the lack of jobs and growth in minority communities; lax federal oversight of banks and corporations; the stock market’s focus on short-term gains over long-term growth; the waning influence of labor unions; the offshoring of American jobs; and tax policies which have increasingly favored corporations and ultra-wealthy individuals. A government controlled by wealthy individuals and large corporations will be much more likely to harm the environment and subvert democratic processes. It will cater to the defense industry abroad and the for-profit prison industry at home. It will hamper racial justice, because true equality cannot be achieved without effort and cost. Its policies are likely to foster growing instability at home and abroad, affecting virtually every aspect of foreign and domestic policy. That is why runaway inequality is the central issue of our time. It stifles democracy and leads to a more dangerous world. We should, of course, demand that political candidates advocate the right social, foreign policy, and environmental decisions. But even the best candidates will find it impossible to consistently carry out the best policies in a society where so few have so much and so many have so little. Here’s the good news: Today’s inequality was created by choice, which means we can make different choices. We can end the great wealth grab – by strengthening collective bargaining rights, regulating Wall Street and large corporations, fixing our tax system, and renegotiating bad deals like NAFTA while blocking such deals in the future. Ending the great wealth grab will improve life for most Americans, and will make it easier to reclaim our democracy. It can be done. To say otherwise is to encourage a false cynicism that breeds permanent despair. It’s true that it will take a major political shift, the kind of mass movement Bernie Sanders calls a “political revolution.” But it can be done, once we understand and accept the challenge that lies before us.